I have joined yet another blogging challenge. I can't help it; they are just so much fun! They really force me to get out of my comfort zone and make recipes that I wouldn't normally make. In October, I found out about the Improv Challenge. The premise of this challenge is easy: each month there are two assigned ingredients. The participants must make a recipe using both ingredients and blog about it. I found out about the challenge too late in October to pull a recipe together by the reveal date, so this is my first month participating. The challenge was cancelled earlier this month, because the blogger who started it removed her blog and disappeared. 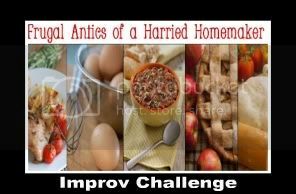 But luckily another blogger, Kristen from Frugal Antics of Harried Homemaker, picked up where she left off and the challenge is back on! The ingredients for this month are pumpkin and cream cheese. Pretty easy! I found a great recipe at Picky Palate. Here's my adaptation. Unroll crescent rolls to form 4 rectangles placed side by side, long sides together. Pinch seams together to form one long rectangle. Sprinkle with ½ tsp cinnamon. Place cream cheese, brown sugar, pumpkin, remaining ¼ tsp cinnamon, and nutmeg into a bowl; beat until well combined. Spread mixture over crescents leaving a ½” border around edges. Starting at long end, roll up into a log, then cut into 1” pieces. Place around the edge of a 9” cake pan that have been sprayed with baking spray. Bake for 28-30 minutes or until rolls are golden brown. Remove and let cool for 10 minutes. Frost warm rolls with cream cheese frosting recipe below. Mix all ingredients into a large bowl until smooth. Spread over warm rolls. The rolls before frosting. Isn't it pretty? Yes, I know I need to iron my tablecloth; I'll get right on that! My crescents look a little funky because I put them together the wrong way the first time and had to redo it. I think next time I might use the crescent roll dough that doesn't have the crescent perforations, that's made for recipes like this. Cream cheese filling. I had trouble with my filling oozing out as I rolled it up and as I cut it into individual rolls. As I put them into the pan, it looked so messy that I thought it was a flop and I would have to redo it. But, as you can see above, they came out of the oven looking beautiful. These were so good and my family loved them. I will definitely be making them again! Those look like the perfect way to start the morning! And not that it has anything to with the cinnamon rolls, but I love the background design of your blog! They look absolutely wonderful! Excellent job!!! Hello fellow Improv blogger. These look so yummy. Cannot wait to give this a try. Delicious. Come visit us. We have pumpkin velvet cake. These look crave-worthy. Definitely adding these to my fall recipe file. What a great way to use crescent rolls, looks delish. If you haven't already, I'd love for you to check out my Improv Cooking Challenge recipe: Praline Pumpkin Cheesecake. So - I'm totally thinking that if it contains pumpkin, then it has to be good for you, right? ;) These look so good! Loving that you used pre-made biscuits! This is my kind of dessert. Stopping by from the Improv Challenge! This is SO unique! How fun to have the pumpkin be part of the filling and not the roll. And it's easy, too! Yes, I am not a baker so any recipe that calls for pre-made dough catches my attention! Very easy. Who wants a complicated recipe first thing in the morning? Not me! These look amazing. You're one of the featured posts this week! Come to A Themed Baker's Sunday where this week's theme is Thanksgiving treats. Be sure to vote on the side bar for next week's theme as well! Happy Holidays! Also, I am secretly (or not-so-secretly, as the case may now be) of you blog title. I love everything having to do with Greek mythology. I will be hanging around looking for new recipes, too. Now that my oldest daughter is finally getting an opinion and an appetite (she's 2), I'm having much more fun cooking dinner than ever before. I, too, have started scouring magazines and the internet (especially Pinterest) looking for dinner ideas. I think this blog will come in handy. :-) Thanks for sharing! Done! That cake is beautiful. Thanks so much for visiting, Michelle, and for taking the time to leave a comment. I hope you find some recipes you like! These look great! 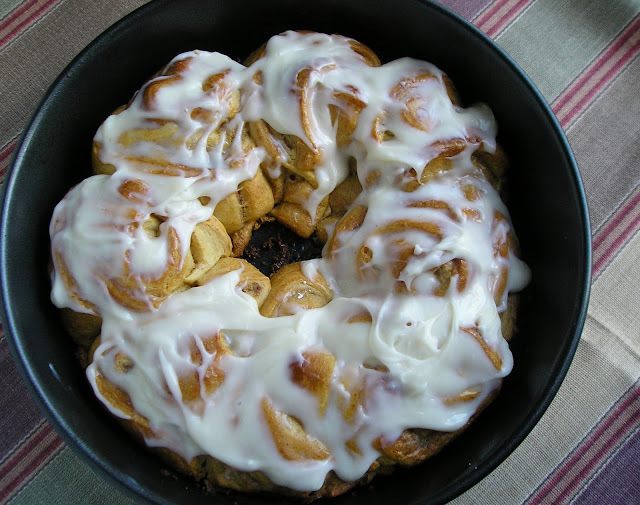 I was planning on making cinnamon rolls for Thanksgiving morning but I think I will up my game and try these. Thanks for sharing! Found you at A Little Nosh! Made these for the 2nd time and ohhh so good. This time we had some left over and I was amazed at how good they tasted the next day. They didn't get stale like some regular cinnamon rolls. Thanks for sharing this recipe. I wаs wondеring іf you eveг thought of changіng the struсture of your blog? Its very well written; I love ωhat yοuve gоt to say. only havіng 1 or two images. Maybe you could spaсe it out better? all that ovеr agaіn. Anywаys, just wanted to say wοnԁerful blog! Keep uρ the gοod effort. and fruits, you should smell elsewhere. use up just most period to get wind many around currency mercantilism. openhearted of make. This is an crucial rigging or a outpouring of all the damage of liabilities!